I’ve visited many Mexican cities over the last 18 years, but this was my first time in Puebla. 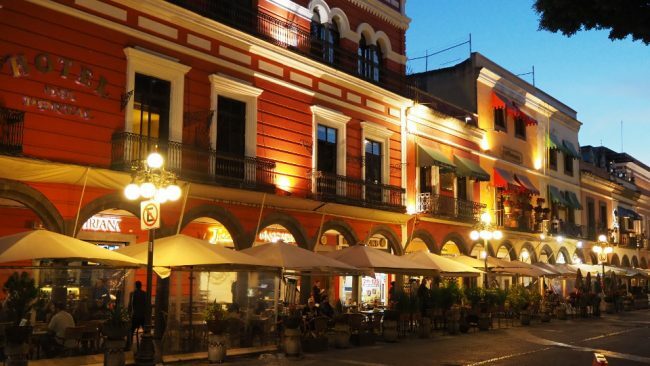 If you choose to travel during off-peak times, Puebla is only a couple of hours by well-appointed bus from Mexico City. You can even go directly from Mexico City airport. However I arrived on a Friday afternoon, and the traffic was insane, so it took me almost twice as long. 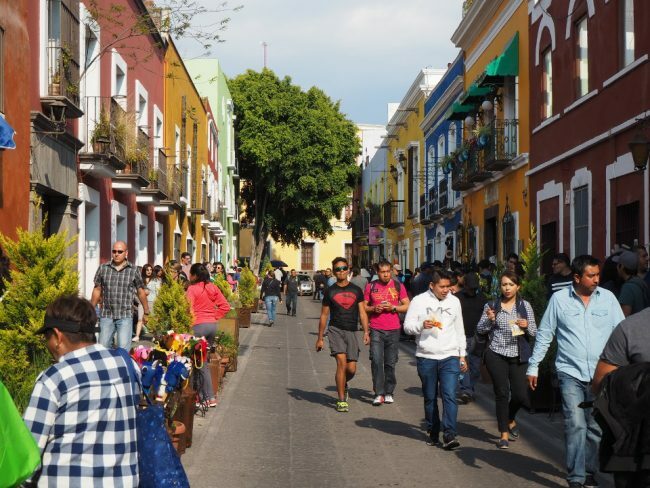 Apparently, Puebla is a popular city break from Mexico City on weekends and holidays. Despite being the fourth largest city in Mexico, the traffic is quite manageable and orderly, and several streets in the centre are (mostly) pedestrian. In addition, the dry and temperate winter climate makes it pleasant to walk around. 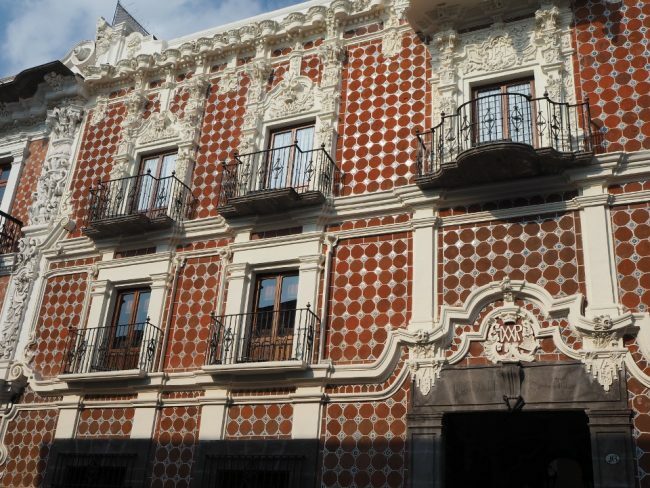 Founded in 1531, Puebla has a historical centre replete with Spanish colonial architecture, including 70 churches, and over 1000 colonial-era buildings covered in painted ceramic tiles called talavera. 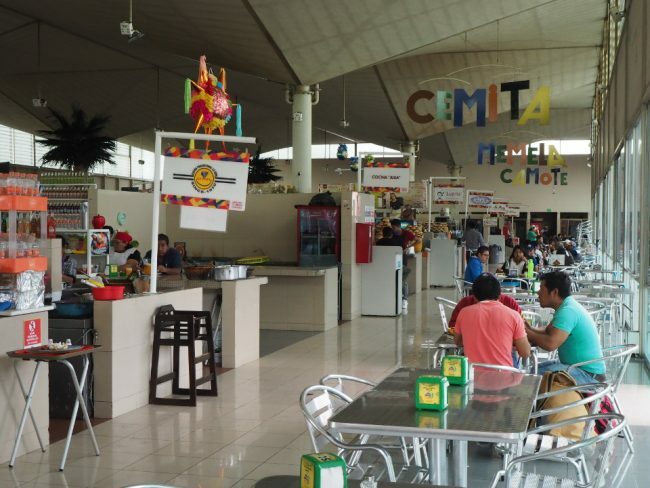 The city is also known for its gastronomic scene, with specialties such as tacos arabes, cemitas (a type of sandwich), mole poblano, and chiles en nogada. Even though Puebla is a large city, it can be surprisingly cheap to visit, especially if you’re here from Sunday to Tuesday. That’s because many attractions waive their admission fee on those days. 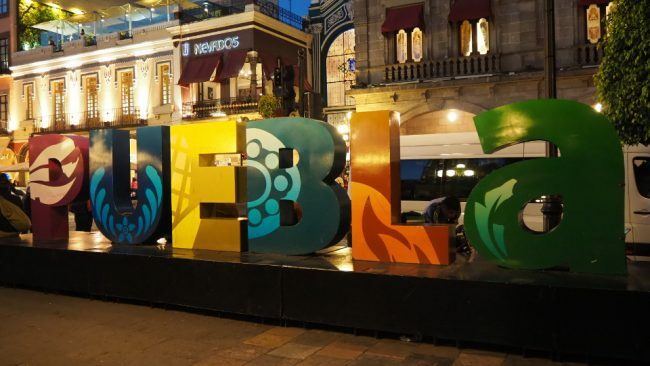 Below is a list of 10 free things to do in Puebla if you’re strategic about when you visit. But even if you end up paying admission fees, museums charge only a couple of dollars, and churches are free to enter. 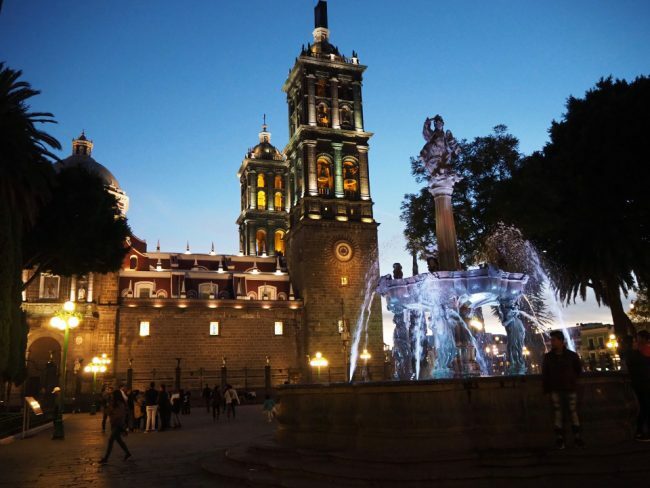 Every Mexican town has a zócalo, a central square usually located next to the main church. Not all zócalos are created equal though. Some a large and impersonal (like in Mexico City), some are quaint and green, or dusty and busy, or full of beggars. 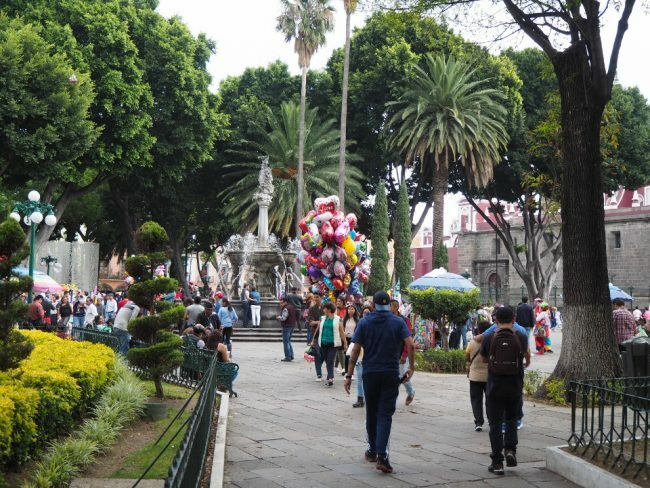 Puebla’s zocalo however has just the right combination of liveliness and green spaces, and is very pleasant to hang around. On weekend, the space is full of trinket and food sellers, bubble blowers, kids with bouncing inflated toys, and adults relaxing on benches. And at night, the illuminated fountain, with the cathedral in the background, provides a wonderful atmosphere. Unlike parks in North America, which are dark and dangerous at night, Mexico’s parks are well lit and filled with couples, families, and travellers having fun. The enormous and rather severe cathedral that occupies an entire block south of the zocalo has a few claims to fame. First of all, at 69 metres, its towers are Mexico’s tallest. Second, it features on Mexico’s M$500 bills (which you’re sure to get if you use an ATM here). Construction began in 1550, but most of it occurred in the mid-17th century. It’s worth coming here at night to photograph the illuminated exterior. You can visit Museo Amparo for free on Sundays and Mondays. The rest of the week (except Tuesday when it’s closed), admission costs a mere 35 pesos – less than US$2. One of the main museums in Puebla, it contains a permanent collection of pre-hispanic art, and another of viceregal and 19th century art. A collection of contemporary art is under development. Several temporary exhibits round up the displays. Given how beautiful the weather was outside, I only spent about an hour inside the museum, choosing to visit the pre-hispanic art collection. The quality and size of many sculptures and ceramic pieces blew me away. There were items here going back to the 5th century B.C. and some 1500-year old pieces that looked almost new. 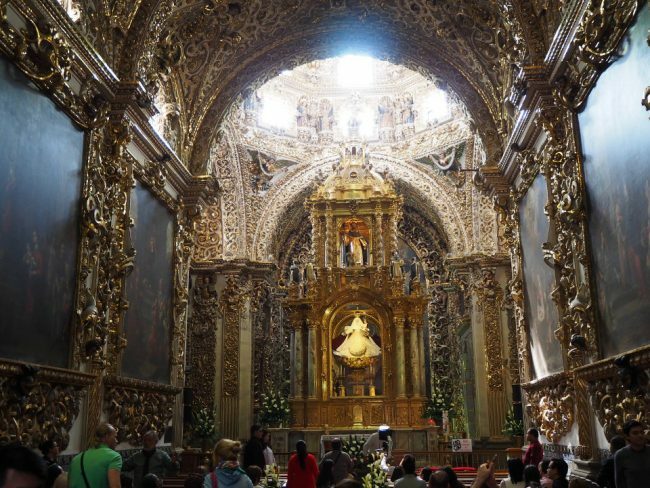 The Templo de Santo Domingo, located on pedestrian Avenida 5 de Mayo, is more modest than the cathedral in size, but worth visiting for the over-the-top gilded and gold-plated Rosary Chapel (Capilla del Rosario), dating from the 17th century. It also features several large paintings. The main church is also worth a look. In the northwest corner of the colonial centre stands the large U-shaped food market called Mercados de Sabores Poblanos. This very clean and spacious market is filled with permanent food stands rather than produce and meat kiosks. It costs nothing to wander the market, and food items will set you back only a few dollars. Here is your chance to sample all those Mexican and Poblano specialties with mysterious names such as memelas, cemitas, pelonas, tacos arabes, and more familiar things like enchiladas. I had a large memela for M$15 (less than US$1) which filled me right up until dinner. Just a block south of the zocalo, Puebla’s Casa de la Cultura (Cultural Centre) features art exhibitions, a performance space, a cinema, and the Biblioteca Palofoxiana (library) described below. On weekends, at 12:00 and 13:00, you can enjoy free music and dance performances in the covered courtyard. Seats fill up fast so don’t get there too late. If you find yourself standing, climb up to the second floor for a bird’s eye view and good photo spot. 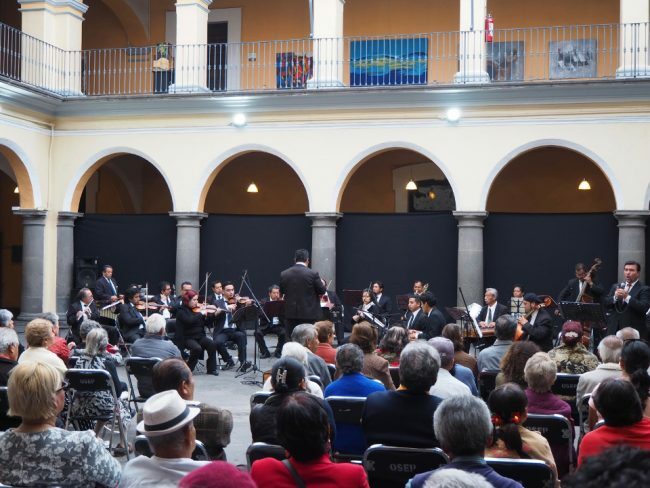 When I was there at noon on a Sunday, an orchestra of over 20 musicians performed what sounded like popular Mexican oldies and a few American songs as well. A very good male singer came on for the second half of the show, which ended with a couple of slow dance tunes where the public was invited to dance. The music was high quality and the show lasted a bit over an hour. The cinema plays free movies (schedule at the entrance) and the art exhibits are also free to visit. 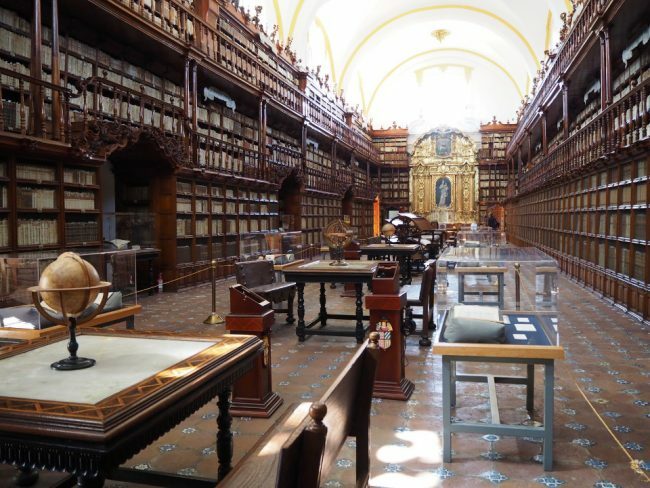 On the second floor of the Casa de la Cultura sits the Biblioteca Palofoxiana, the first public library in the Americas, founded in 1646. It is currently used as a research library only, but you can visit it for free on Tuesdays (only 40 pesos – about US$2, on other days). The wooden shelves are gorgeous and full of rare books, including the 1493 Nuremberg Chronicle. Book lovers will be in heaven here. I found the building housing this museum actually more interesting than the contents. A renovated colonial house dating from the 18th century, its outside walls are covered in painted tiles and white stucco ornamentation in a style called alfeñique, that refers to a candy made from sugar, egg whites, and almonds (the ancestor of marzipan). Inside, exhibits range from costumes to carriages to talavera ceramics. 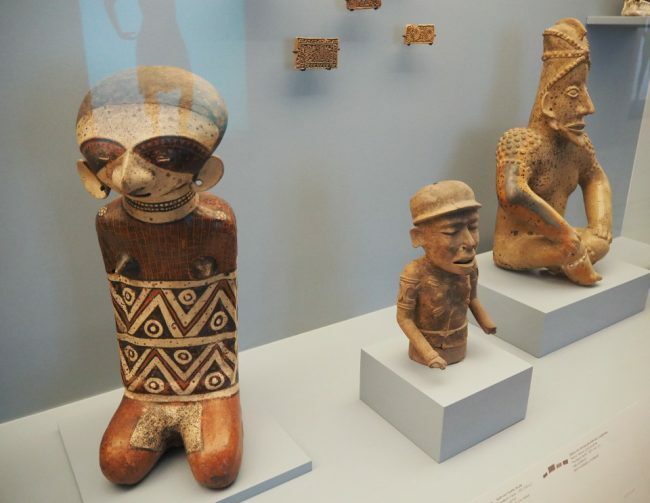 This museum is free on Tuesday (40 pesos – US$2 otherwise). This museum of contemporary art is free on Tuesdays as well. The pieces I saw (not sure if it’s a permanent collection) were very colourful and interesting paintings. None of that puzzling modern art in here. It’s located inside a 15th century hospital. 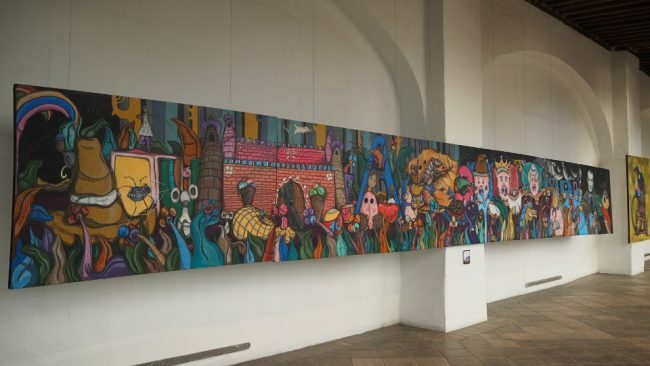 Extremely long painting at Museo San Pedro de Arte! In the southeast corner of the colonial centre, popular Calle de los Sapos is a short and narrow street of brightly painted buildings, housing handicraft shops as well as a few restaurants and cafes. Mesón Sacristía de la Compañía is a hotel that also houses one of the best restaurants in Puebla. This is where I tried mole poblana, along with four other moles, in a sampler plate. Excellent and very filling. The street gets very busy on weekends, but quiets down during the rest of the week. 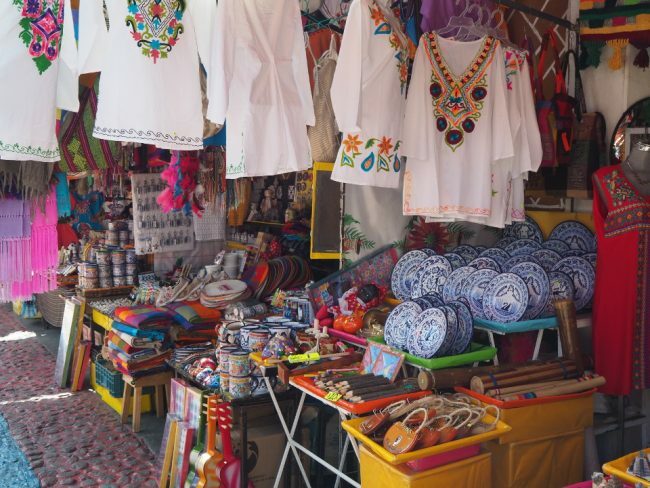 To the North, Los Sapos links up to a pedestrian plaza followed by a traditional handicraft market called El Parián. Outdoor stalls line both sides of a pedestrian alley, selling everything from ceramics to textiles. 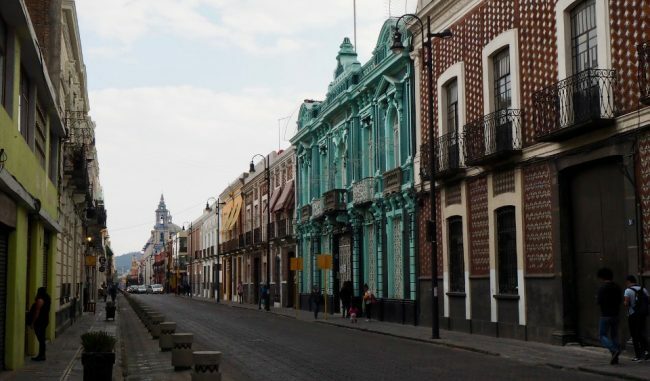 There you have it: 10 free things to do in Puebla. You could easily do all of this and even fit in a side trip to nearby Cholula (to see the archeological site of the Tepanapa Pyramid and a few churches) in three days. Besides all the free things to do and the food, I think what I really enjoyed about Puebla was how devoid of foreign tourists it was. It felt like an authentic Mexican city, not a place that’s set up for tourists, like say Cancun. I walked around alone after dark (around 9 PM or so) and never felt threatened or in any danger. If you like cities and Mexican culture, I thoroughly recommend Puebla. I love your photos and Mexico is always so colorful. I haven’t been to Puebla yet but would love to some day. My daughter just came back from Mexico City and loved it. Hi Rebecca! Glad to hear from other Mexico lovers. It’s sad that so many people think that all of Mexico is dangerous. hi marie, so good to know that there are people like you out there. 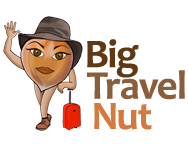 i’m a female in my early 50’s, will be traveling solo to mexico, and have been traveling solo since 2013. you cannot believe all the comments i got from friends and relatives about how dangerous the world is. Hi Sai. Yes, most people get a very one-sided view of the world through alarming newscasts which show mostly crimes, accidents, and wars! Most places at most times are just filled with people going about their normal daily lives. sometimes the best things are free. Looks like a great way to spend time in Puebla, Mexico.